Signed by writer Rob Hughes and artist Thomas Yeates. NEW!!! Click the Play Button below to listen to Vobes Show podcast featured The Outlaw Prince. "I really enjoyed the book and it bought back a lot of memories as I had read most of [ERB] books. You should be very proud of this work." 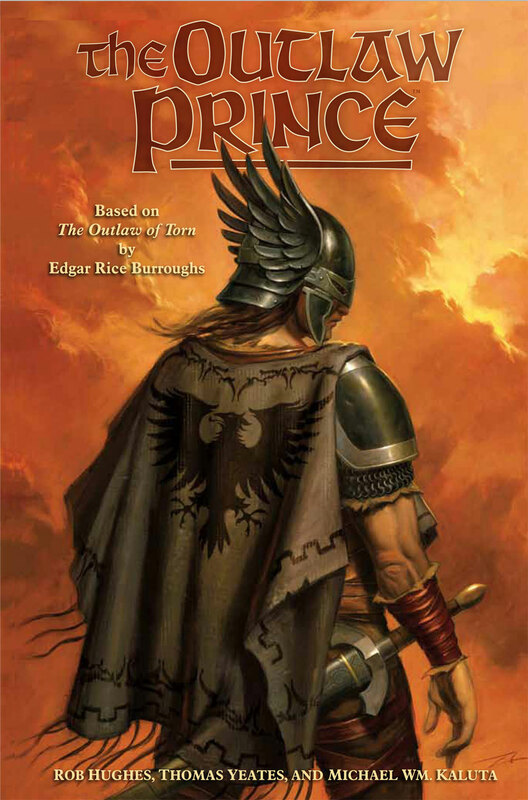 "Every man, women, and child should pick up The Outlaw Prince! An inspiring saga that you don't want to put down and an end that keeps your imagination craving more. The writings of Rob Hughes melt into the illustrations creating a masterpiece. I could go in to great detail as to why it is such a brilliant tale but my words would not do it justice. Discover it for yourself and enjoy!" Subject: Outlaw Prince - Whoa! You hit it out of the ballpark! I read it last night and just loved it. I had some late night work to do, so I was just going to read a little, but I kept sneaking back to see what happened next. 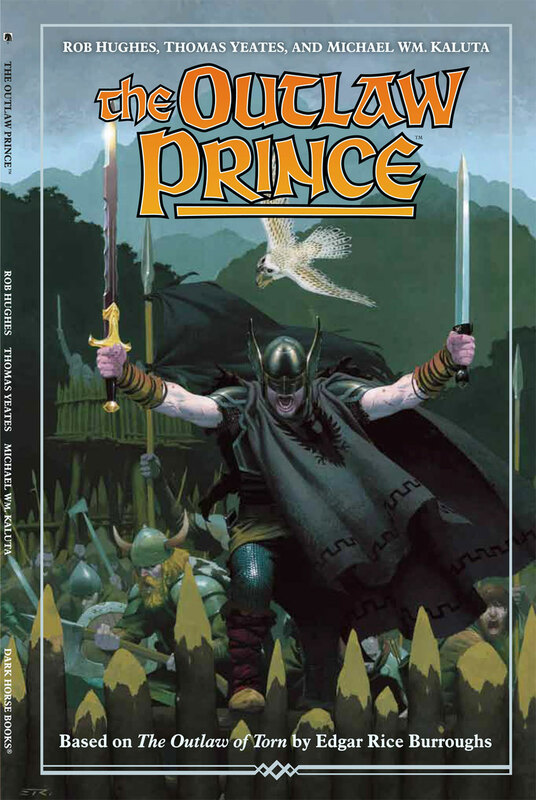 And even though I am a big ERB reader, and I love the whole King Arthur/Prince Valiant thing, I was unfamiliar with this story. Your pacing, characterizations and twists and turns really kept me going. Love the dialog too - some great, clever turns of the phrase. And you know I love Thomas's work - I think this might be the apex of this career. Breathtaking. I'm going to buy extra copies as gifts -it's that good. Can't wait for issue #2!" "Rob, I couldn't put it down from beginning to end. I hung on every word, every scene, every depiction. It was just as I read the original novel the first time around, I just couldn't put it down. So much background material has gone into this, the whole argument between Henry and De Montfort, the insult on De Vac, the wasteless slaying of Lady Maud, the splendour of the castle and the darkness of London. I could go on - and will do privately to you, but let's just say this, I think Burroughs would be very pleased with what you've done and what you have added to one of his finest novels." "Being a fan of historical epics, I was very excited when I heard about The Outlaw Prince. After reading it, I was even more excited. The art work was very rich while maintaining a strong emotional impact. The detail was deep and the action scenes are fluid and exciting. I especially loved the broad color pallet used. The story itself deepend and expanded Burroughs original, with pains being taken with historical accuracy and character development. If you are a fan of the genre, you will love it. If you are not, The Outlaw Prince just might make you one." This timeless tale unfolds during the tumultuous Second Baron's War, when a young prince is ruthlessly abducted from his royal family, taken into the rugged mountains of Derbyshire, and brainwashed to forget his very heritage. He's trained to become the greatest swordsman the world has ever known--and grows to be the most dreaded name in all of Britain! With civil war looming upon the horizon, the fate of the kingdom of England may very well rest in his hands! Presenting a medieval adventure based on The Outlaw of Torn, written by Edgar Rice Burroughs. A classic Edgar Rice Burroughs novel--adapted for a modern audience! This deluxe limited edition features an introduction by Burroughs expert Frank Westwood, a feature-length article by Rod Jackson exploring the history behind the story and a painted cover by artist Alan Lathwell! All Materials are Copyright © 2005-2014 Rob Hughes. All Rights Reserved.